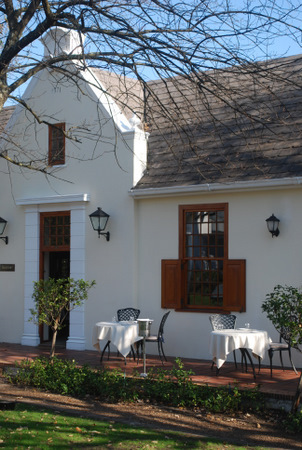 Franschhoek’s Huguenot Street eating has another option since Ryan’s Kitchen opened at Rusthof Country House. Chef Ryan Smith and Russian wife Svetlana serve lunch and dinner in the small dining space, and summer should see lunches and even tea and scones on the lovely lawns. A small open kitchen and limited tables means diners are within chatting range of the chef, making the dining experience intimate. Smith boasts an impressive resume of big-name hotel stints. 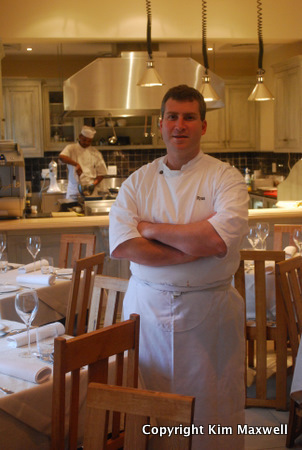 I found the style too contrived when he was responsible for menus at Mange Tout fine dining restaurant at Mont Rochelle Hotel, but at Ryan’s Kitchen his delight in preparing food on a small scale shows on the plate. Dinner starters and desserts I tried were particularly creative, which might explain their price tags (R65 - R75 for most starters; R95 – R115 for mains; R50 to R55 for desserts). I’ve been told lunch options are a little simpler; my only experience is of dinner. Smith’s innovative style is visual yet playfully tasty – ingredients receive a contemporary make over and nostalgic South African foods are incorporated at times. But don’t make the mistake of expecting traditional country interpretations. Dishes such as ostrich bobotie have a twist – in fact you often see Smith using his blowtorch for finishing touches. A frequently-changing menu always has a vegetarian option, and could feature peri-peri duck liver parfait with winter melon jelly, salted caramel and bitter chocolate spray, or seared smoked trout masala with prawn bell pepper and chorizo emulsion. There’s vacuum-poached fish with smoked potato puree, streaky bacon and winter greens, followed by naartjie panna cotta partnered with citrus salad and oatmeal crunchies, or Milo melktert with clove ice-cream and popping chocolate. And if you don’t fancy the return drive, the restaurant’s location inside Rusthof Country House could provide a lazy excuse to negotiate a room from owner Ruth McCourt.